Elephants tethered to trees on a river bank. 'Patelgunge April 12 1833'. 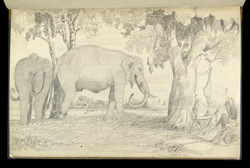 bl.uk > Online Gallery Home	> Online exhibitions	> Asia, Pacific and Africa Collections	> Elephants tethered to trees on a river bank. 'Patelgunge April 12 1833'.